We have an announcement! 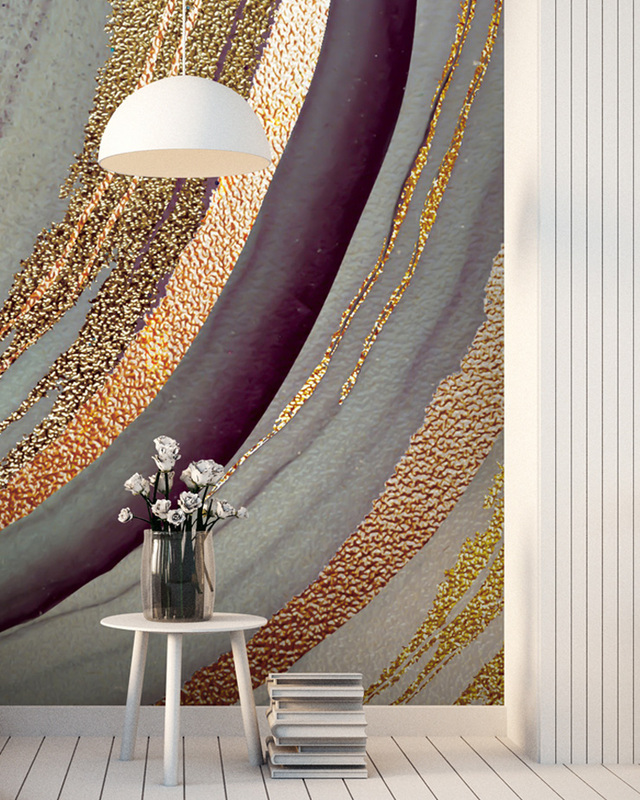 We’re super pleased to introduce you to our luxurious geode wallpaper murals created by artists, Lara Skinner and GCC Artworks. The colours of gems and amethysts and details of other precious stones have been reflected in furniture to lampshades since 2014 and are still proving popular in many interior aspects. 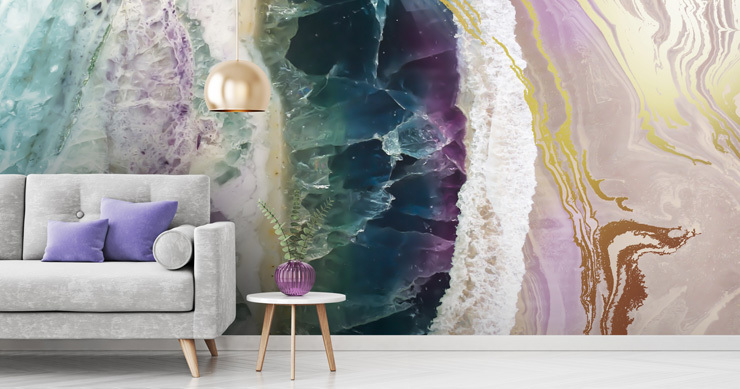 Geode and amethyst details have brought a sense of wellness and style to many interiors in the past seasons, but our latest designs will bring dramatic luxury to your décor. Featuring bands of contrasting colours and a hollow, sparkly, crystal centre, geodes offer a lot in term of design. 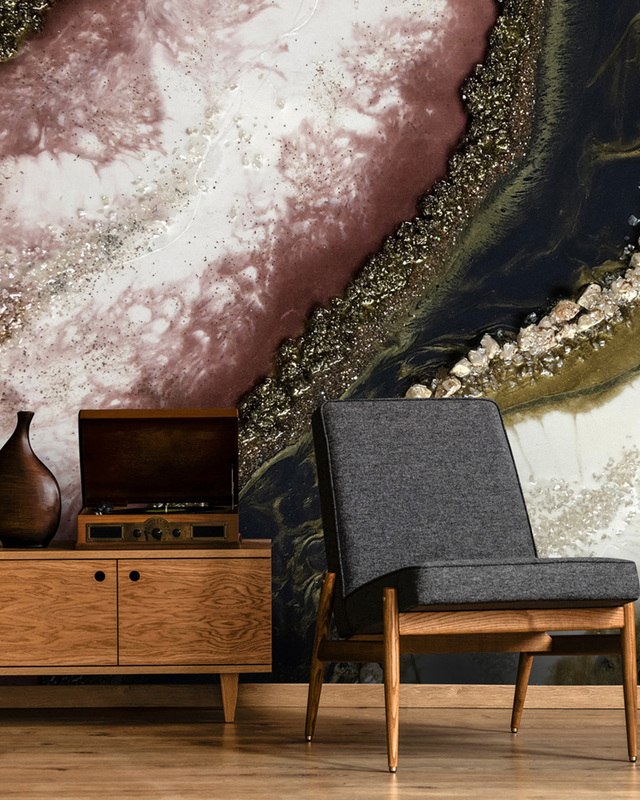 In a bid to take the trend to the next level, we have signed up two new artists who specialise in geode and marble designs, and who also embrace rich colours and depict textures. Born and raised in Leicester, Lara Skinner has always had a passion for anything creative. Lara began her career designing record sleeves after graduating in Graphic Design/Illustration at Camberwell College of Art. She knew there was no other career path for herself other than being an artist. Her work has since been displayed in many galleries and can now adorn your walls in the form of bespoke wallpaper murals. With a passion for embracing textures upon layers and forming collages, Lara’s 6-piece collection comprises of intricately detailed marble patterns amongst precious stone replicas. The purple-themed collection features the bands of contrasting colours formed in geodes and golden accents to add glamour to the designs. These wall mural designs are a great consideration if you are looking to create a beautiful feature wall in a tranquil bedroom or a contemporary living room. On the deeper-toned spectrum, abstract fluid artist, Gemma Coates (GCC Artworks) has developed geode designs, rich in deep, formal colours. Her designs too, feature the colourful bands of geodes and textures of the tiny crystals forming the hollow inside of the stone. 'Inspired by the beauty and intrigued by our natural world’, Gemma focusses on creations made with resin and ink with a hint of mixed media for texture. Her passion aids her to create beautiful jewellery to cushions and now wall murals. “My entire philosophy as an artist is to bring art to everyday life, which is why you will find me creating everything from wall art and home décor, to gifts and jewellery. I like to make artworks that people just want to look at, to spruce up the mundane with colour and texture and just create something a little different. With her newly opened shop in Leighton Buzzard, Bedfordshire, Gemma was discovered after she had one of her designs printed as a wall mural for the shop. We saw the talent in her design and knew that you guys would love to see a collection. “Working with resin, inks and various mixed media, I strive to recreate the outside world, often incorporating a rich and varied colour palette, along with a range of metallics for added opulence. In a world so saturated with technology and man-made structures, it is important to step away and get back to nature from time to time. Busy lives often don’t allow for this but enhancing a space with a mural of one of these designs will blur the distinction between the interior and exterior landscape and offer a healthy dose of Mother Nature’s wonder. Her 8-piece precious stone collection presents fascinating geode and marble designs that transpire sophistication in rich colours that signify luxury. They will make the perfect addition to any room looking to add a touch of luxury or create a breathtaking feature wall. All of the geode wallpaper murals are available for print onto a choice of wallpaper materials, including two types of paste-the-wall wallpaper and a peel and stick wallpaper - which is great for rented accommodation! Wallpaper paste is provided free with both paste-the-wall materials and has rigorously been tested for its compatibility with the wall murals. 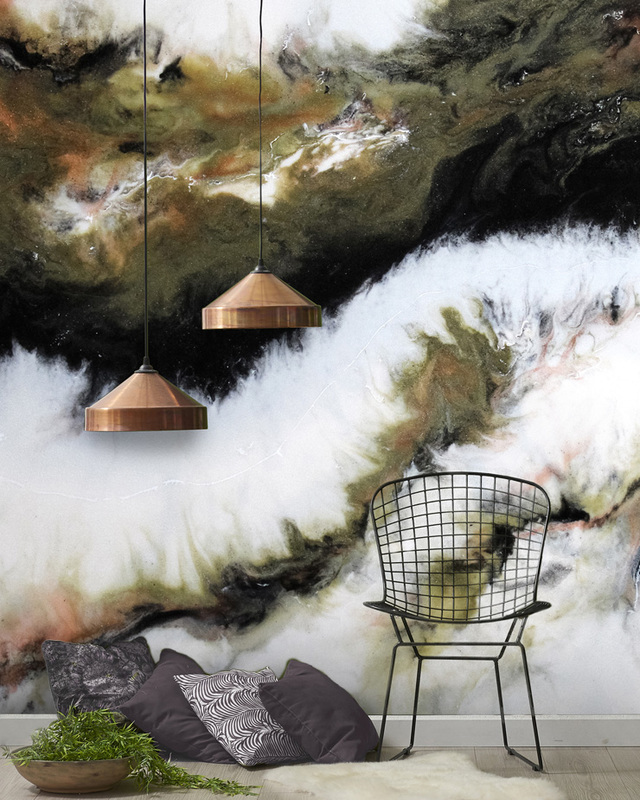 If you enjoyed this blog post luxurious geode wallpaper murals, then you may also like to read our post on the latest interior trends. 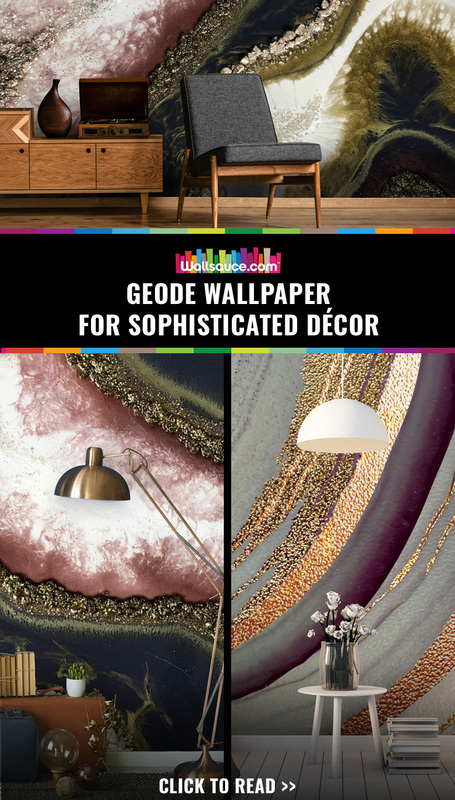 What room do you think one of these geode wallpapers would suit the most? Leave your answers in the comments box below. Stay ahead of the game with the latest trends and inspiration straight to your inbox.